The new Bonn Square in Oxford, United Kingdom. Bonn Square stands on the site of the ancient graveyard of St. Peter-le-Bailey Church in Oxford, England. The church was demolished in 1874. A memorial to soldiers who died fighting in the North West Province of India was erected in 1900. The square’s name commemorates Oxford’s twinning with the German town of Bonn in 1947 – two years after the Allies defeated Germany. 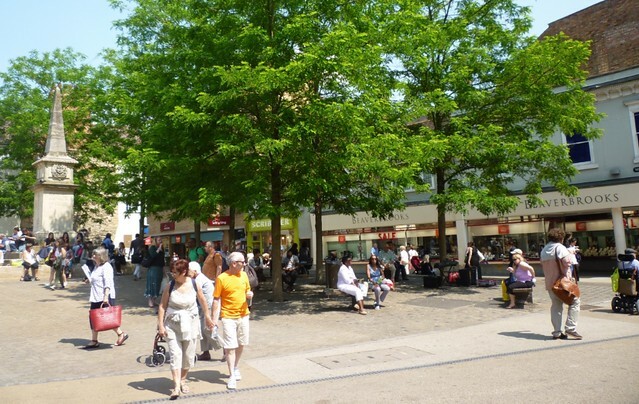 In 2008, Oxford City Council declared Bonn Square “a badly run-down visually fragmented public square”. Its now patchy grass and towering trees provided shelter for the homeless, perched on the surrounding wall nursing cans of cheap beer. The Council promised to transform it into a modern city square and events space. Many objected to the Council’s plan – the removal of the “last link with the lost church of St. Peter-le-Bailey,” and of ancient trees. In protest, one homeless man, Gabriel Chamberlain, built a tree house in a doomed sycamore tree, declaring: “It’s not just about saving the tree, but about saving the planet.” The homeless men, known for asking for beer money, collected donations to save the tree. Hundreds of protestors came out to support him. The Council employed 24-hour security guards, trained a spotlight on the tree house and built a steel fence around the square, saying anyone who crossed it would be arrested for trespassing, even though it was a public place. When 18 year-old student Jonathan Leighton made an unsuccessful attempt to throw a bottle of water up to Gabriel, the police arrested Jonathan “on suspicion of littering”. They handcuffed him, took his mug shots, fingerprints and DNA and held him at the station for three hours. Police later apologized for the inconvenience and paid him £1,500 compensation which he donated to environmental group, Thames Valley Climate Action. After twelve days, Gabriel descended and was arrested. Despite hundreds of protestors, police could find no witnesses to his crime; they released him without charge. The trees were felled and the square refurbished as planned. New, more manageable trees were planted instead. There are no homeless men to be seen there now. 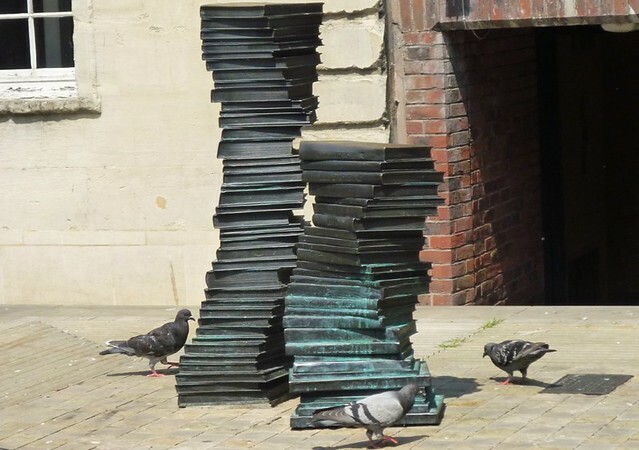 Sculpted brass books in the new Bonn Square. Post by Sabita Banerji. Photos by Ranjit Banerji.